Every aspect of child’s development is important, and as a child grows, it’s critical to address each part of the development. One of the many aspects you will focus on when you study childcare is a child’ development of their fine motor skills. In addition to parents, child care educators play significant roles in the development of a child, including their fine motor skills. View our child care courses here, including the Certificate 3 in childcare and the Diploma. We’d love to have you on board! Courses start on the 17th of every month, in training centres in Sydney, Melbourne, and Brisbane. Developing a young child’s motor skills is very important as this is helps in coordination and control. 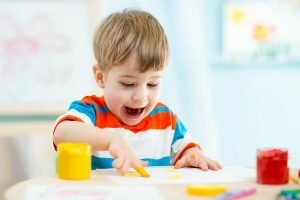 In the child care setup, there are several activities and games that child care educators can do with their young one to develop and improve their fine motor skills. Who knows, a tot at your child care centre could be the next Jackson Pollock! A great way to strengthen a child’s agility, dexterity and hand-eye coordination is by finger painting. While they are busy creating their masterpieces, they are also working on their fine motor skills! Is that a star? A spider’s web? Or are those cat whiskers? Whatever it is, there are certainly a number of shapes a child make when playing string games. This fun game will help improve a child’s hand-eye coordination and finger strength. Using only their hands and a piece of string, they can weave, wrap, and reach to create their own mini-masterpieces. This activity can be a little complex, so best to leave it to older kids. Watch them as they concentrate with all their might to achieve fun shapes! Conjuring up memories of your own youth, play dough has certainly stood the test of time for generations. Kids can spend countless hours moulding and mixing different colours to create… well, anything they set their mind to, really! Set them a challenge (“Can you make your own car?”) or let them take total control of their imagination and create anything they like. They will be so thrilled to tell you all about their creation! Their tiny hands will be fiddling, moulding, squeezing, and pressing the dough, all of which contribute to improved fine motor skills. There are so many benefits when young children make accessories out of macaroni! Using pieces of uncooked macaroni and some string, kids can put these together and make necklaces and bracelets. Or, give them a plain cardboard box and some glue and glitter and let them make a meaningful keepsake they can present to mum on Mother’s Day. This activity will not only benefit their ability to control or manipulate objects, but will also let their creativity run wild! Enrol in Southern Solutions’ childcare courses now! Working on a child’s fine motor skills is one of the many responsibilities that child care educators have. When the fine motor skills are being developed, we are working on strengthening and controlling the different parts of their bodies. 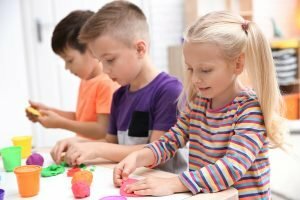 If you wish to become a child care educator, learning about how to develop a child’s motor skills will be one of the many lessons that will be part of your course. Southern Solutions offer a range of childcare courses, including the Certificate 3 in childcare and the Diploma, that teach aspiring child care educators to be passionate about their nurturing the overall growth and development of all children. Our courses are available in Sydney, Melbourne, and Brisbane – and they start on the 17th of each month. For more details, call us on 1300 656 321 now or fill out this form and we will be in touch!